﻿ Queen Pattaya Hotel (Thailand) | FROM $18 - SAVE ON AGODA! 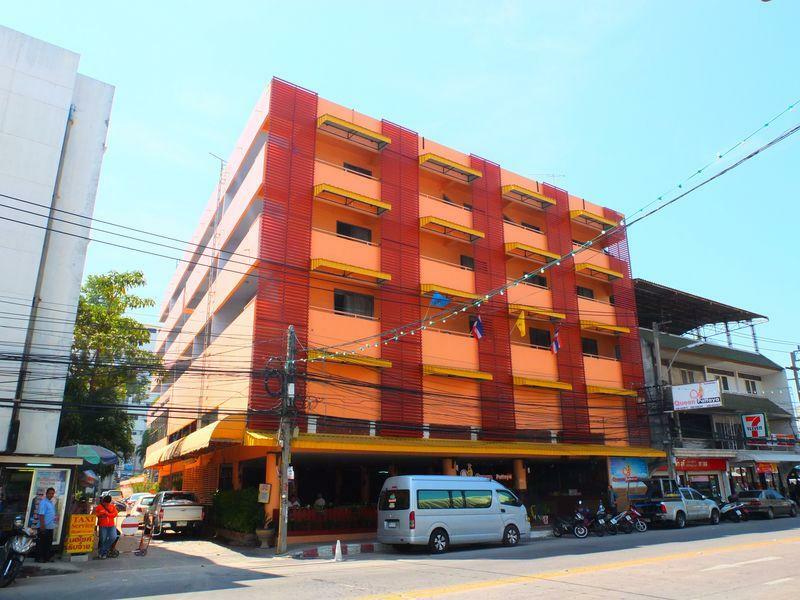 Have a question for Queen Pattaya Hotel? "A great location with all facilities and the beach in close proximity." "Pool very clean and quite staff exelent"
"I come to this hotel all the time it is in a good location friendly staff good cleaners always make u feel at home thank you to all the staff at queen pattaya f..."
"Staff are friendly and helpful and the rooms and facilities..."
Book a visit to the Queen Pattaya Hotel in Pattaya for a memorable holiday. The rooms at this hotel look out over the street for beautiful views of Pattaya. The hotel is near Ama Fashion, Zara's Custom Tailor, Driving School Centre, Pattaya Klang Market, and Royal Garden Plaza. It offers various facilities for guests to enjoy, such as a fitness center, a spa, table tennis, a garden, and an outdoor swimming pool. Featuring a bar, restaurants on-site, a coffee shop, and room service, it has a range of dining and snacking options. Offering guided tours, it is a great spot to stay to learn about your surroundings and see everything you can while you're here. The Queen Pattaya Hotel has several convenient features, such as safety deposit boxes, a smoking area, a salon, and a selection of shops. All of the rooms come with air conditioning, a shower, a desk, and a refrigerator, as well as free bottled water, satellite or cable channels, and a seating area. There's free Wi-Fi in all rooms, as well as Wi-Fi in common areas, ensuring that guests are able to contact their friends and family back home. The Queen Pattaya Hotel has numerous useful services for you to make use of, such as a concierge, laundry services, and luggage storage. The front desk is open around the clock, so there will always be a member of staff behind the desk to answer any questions that you have. This hotel offers check-in from 02:00 PM and check-out until 12:00 PM. With public transportation close by, you can easily get anywhere you want to go. The nearest airports are Utapao International Airport (UTP) and Suvarnabhumi International Airport (BKK), which are situated 30.5 km and 85.1 km away. "This is a good value budget hotel that is just meters to the..."
This is a good value budget hotel that is just meters to the beach. It is handy to Central Festival shopping centre and right in the midst of the bar scene. It is ageing and a little tired, but still excellent value for money. This is a budget hotel close to the beach, shopping, restaurants and nightlife. A little tired and in need of an upgrade but you get what you pay for. Staff are friendly and helpful and the rooms and facilities are clean and functional. A complimentary breakfast would add to its appeal. A great location with all facilities and the beach in close proximity. Helpful and courteous staff. Older hotel that needs refurb but clean with a nice pool and easy walking distance to anything you need. Friendly and Helpful Staffs. Comfortable and clean room,Centrally located - walking distance to shopping area , Food and Night entertainment. But if you don't mind the outside Free Music- had an enjoyable stay. I enjoyed my stay and found the hotel very well located, close to the beach, restaurants, shopping and many attractions. The hotel is a little old and tired and could do with refurbishment but is kept very clean. If you want a five star hotel, you pay five star rates - Queen Pattaya is excellent value for the budget conscious. I usually stay at this hotel when in Pattaya. Great location, very helpful management and staff and always good value for money. Stayed here for Songkran. The hotel is pretty old and outdated. In-room wifi costs extra. Free wifi downstairs in the lobby. Shower water pressure was fine and the water temperature easy to control. Location was fine. Getting to Walking street if that's what you want would take a bit of a walk but completely doable(I'm guessing a 10-15 minute walk). For me the room was good value for money. I even extended my stay with another 2 days. It is however located with soi 7, which is loud until 3 am. In my case that wasn't a problem, because I wasn't sleeping before that time anyway. The only little bit negative things is the english of some of the staff. They do however try to help you when possible. There's a pool table but the cover allways remains on, which isn't really inviting. The pool was clean during my stay. It was horrid. The rooms look like they haven't been renovated since the 80's. There a disco tech or something similar behind the hotel (on soi 7) that blasts bass-thumping music until at least 2 am in the morning. You'd better drink as much as you can before going to bed, passing out rather than trying to fall asleep, because the loud music will keep you up. There were people running around the halls late at night, making even worse noise than the loud music and times. The place has long past any days of sophistication and grandeur. I chose this because it was offered at a decent price on Agoda at a great location, and I couldn't book my usual hotel as it was "high season". Rest assured, I WILL NEVER go back to this hotel given the condition of a standard room: dilapidated furniture, uncomfortable bed, very dated TV with cable that isn't up to standard (something you need given the inability to sleep due to the disco that blasts music into the wee hours of the morning) and a complete lack of electrical outlets (I had to plug my computer charger into the outlet in the toilet so I could use it while lying on the bed. My advice is to only choose to stay at this hotel while you look for a cheaper hotel in better condition, which about describes every other hotel in Pattaya. The only virtue this place has is the fact it is walking distance to the beach and the beer bars on Soi 7 & 8. Overall the hotel is good. I checked in at midnight and the staff attention was good enough and got prompt service. The only problem was, my room AC was not working properly. But immediately after complain, they changed my room. So, I am happy with the stay. having stayed previosly many times at this hotel, i was pleased to find it on agoda list,it has vastly improved, from outside appearance,reception area, to room decor and bathrooms, very pleased, have always found the queen to be ideally located for all my itinary, also the staff were friendly and very helpfull. i would have no doubts in recommending this hotel..
Open spacy registration area.. Good atmosphere.. Very friendly Manager and staff.. Older hotel, upkeep seems harder.. Comfortable, clean , friendly staffs and centrally located - shopping , food and entertainment spot. Hotel was good location only thing not good for me was bed was to hard for my back. Comfort , good location and friendly staffs. Enjoyable stay. The hotel is very centrally located, close to beach, shopping, restaurants, nightlife etc. Very clean but old facilities in need of modernisation. Staff are courteous and helpful.